Keith shorted IGT in the Hedgeye Virtual Portfolio at $17.05. 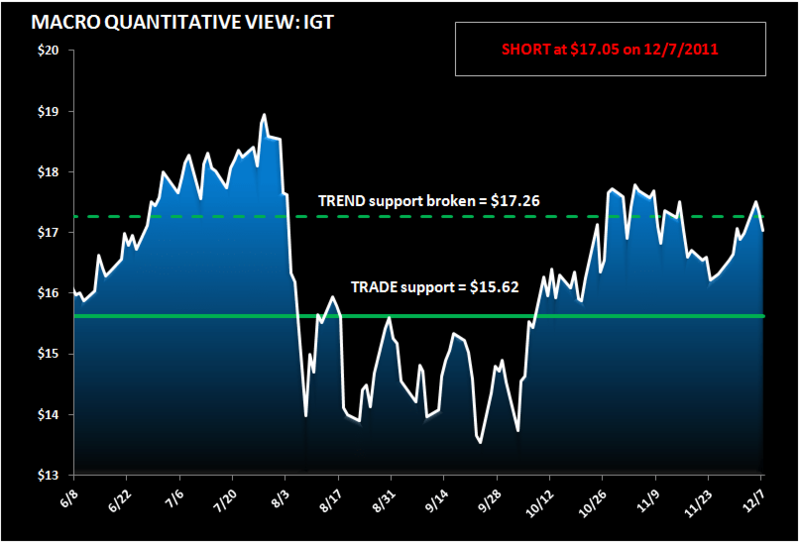 According to his model, TRADE support was broken at $17.26 and TREND support is at $15.62. As we mentioned in "REPLACEMENT REVERSAL" (12/2/11), IGT may have pulled forward slot demand in their previous quarter and some casino capex budgets may have already been exhausted. We believe total North American replacement sales growth in CYQ4 will be negative and IGT will lose share sequentially. IGT's Investor Day is ongoing; we'll update on any incremental news.